Cape Cod's bounty begins with its beauty. Plentiful seafood of all varieties, choice meats and fresh produce abound. Combine this with talent attracted from around the world and you have a destination for some of the finest dining found anywhere. From a romantic, candlelight, seaside dinner…to a casual gathering of family & friends…to a quick bite before theater or a show, Cape Cod has a wide selection of restaurants for all palates & tastes. Below are local restaurant reviews from various sources, including Cape Cod Dining Guide, Fodor's, Frommers. We suggest you also check TripAdvisor.com or Chowhound boards for specific restaurant reviews left by actual diners. We provide our guests with local establishments menus as well as written reviews, so you can choose the restaurant that suits your mood and budget. Check out our Cape Cod blog for an occasional restaurant review by Julia! 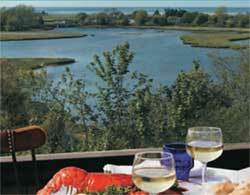 Below are restaurant reviews From Cape Cod Dining Guide, The Premier Dining Guide to Cape Cod Restaurants and guidebooks such as Fodor's and Frommer's. Whenever available, there is also a link to the restaurant's reviews on TripAdvisor or DineSite. The restaurants are listed alphabetically. This sophisticated dining spot serves high-quality cuisine that is a cut above most of the New England-y fare you'll find around these parts. While the exterior is a modest mustard-colored 18th-century Cape, the stylish interior features mosaic floors and mural-covered walls in several cozy dining rooms. The knowledgeable and efficient waitstaff delivers delicious, artfully prepared, innovative dishes. In fact, the whole setup seems almost out of place in folksy Yarmouth Port. On the menu, you'll find seafood dishes, as well as veal, lamb, and, of course, pasta, all in a delicate Northern Italian style. A taste of the veal nocciole (with toasted hazelnuts and a splash of balsamic vinegar), and you'll be transported straight to Tuscany. The new tapas menu, served in the afternoons, features small dishes priced from $6 to $16. This restaurant can get overburdened on summer weekends, so expect a wait even with a reservation. - Frommer's review. Find TripAdvisor's users reviews here. Fabulous new contemporary Italian restaurant with unmatchable Tuscan ambiance. Tuscan and Italian cuisine in a warm, contemporary atmosphere with an open kitchen, stone fireplace, lively bar and outdoor terrace. Amari’s signature first dishes are Antipasto Misto and Cal-Amari (fried squid tossed with hot peppers, diced tomatoes, balsamic vinegar and a roasted garlic sauce). Classic Italian preparations – parmigiana, scampi, picatta, marsala, bonsera – may be ordered with chicken, veal, shrimp or salmon. 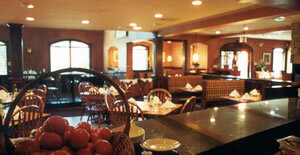 Also serving wood-fired pizzas, grilled meat dishes, pastas and nightly specials. 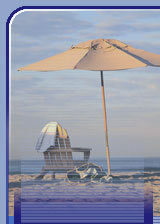 - Cape Cod View Dining Guide. Combining the freshest of Cape Code ingredients with the finest dishes of the Mediterranean. Check out TripAdvisor reviews here. There's now a location on Main St. in Hyannis as well, which is closer to our Cape Cod vacation rental homes. Waterfront dining, daily chef's specials, local fresh seafoods, entertainment. Across from the Ocean Street docks and overlooking Hyannis Harbor, the Black Cat offers a variety of dishes including local seafood and specials such as mahi-mahi, red snapper, black grouper and wahoo. All beef is certified Black Angus and weekend specials include bone-in prime rib and proterhouse steaks. Persian rugs, antique marine and nautical artifacts, and Filipino mahogany paneling grace the dining room and lively bar. Outdoor patio seating overlooking the harbor in season. - review by Cape Cod View. Great steaks, seafood, sushi & so much more! Outdoor raised patio. Entertainment. Lively spot for Cape nightlife with live music, DJs and/or karaoke every night. American bistro menu plus a complete sushi bar. Popular two-for-one sushi specials every Monday night. - from Cape Cod View. A family restaurant. A variety of dishes for everyone's taste. Steps from Chapin and Mayflower Beaches complete with sand dunes and beach grass, Chapin's is the place to enjoy a casual leisurely lunch or dinner. Fresh native seafood, causal family dining, best BBQ ribs on Cape Cod. Extensive menu: "Best family dining in the mid-Cape". Set amidst intimate surroundings in one of three turn-of-the century dining rooms, patrons will be taken on a seasonally inspired culinary journey via an ever-changing menu evening to evening, season to season. We also feature a full bakery and coffee house. Only one place can be voted "Best view of Hyannis Harbor" and that's Dockside Restaurant and Raw Bar. Traditional Schezuan, Mandarin and Cantonese cuisine. Hand-selected USDA top choice meats and fresh local seafoods. Dare to be rare at one of the Cape's finest landmarks. Grille 16 at the elegantly restored Asa Bearse House. Fresh native seafood, lobsters, steaks, great wine list; year-round. Fresh native seafood; casual atmosphere. Authentic Japanese cuisine and sushi bar. Oceanfront Bistro service New American Cuisine. American restaurant featuring fresh seafood in a casual atmosphere. Freshest local seafood, two-pound lobsters, aged steaks and chips. Creative and classic cuisine year-round. The Red Rose Inn is one of Cape Cod's long established guest house/restaurants. The mother/daughter team of Ruth Donaruma and Cathy Cassanos have created a casual but elegant dining experience for your enjoyment. Trendy "City Bistro" with traditional Cape Cod Charm. Come and experience one of Cape Cod's oldest waterfront restaurants. Specializing in fresh native seafood, lobster, chicken. Beef & veal. Open Year Round, featuring fabulous steaks, seafood and pasta. Casual affordable, popular seafood, waterfront dining; seasonal. Welcome to Ying's newest restaurant, featuring the finest sushi, expertly prepared by authentic Japaese Chef Yoshi with 27 years experience. “An upbeat friendly staff with generous portions of delicious food." Bill and Audrey Gray are very specific on what makes Marley's of Chatham unique.